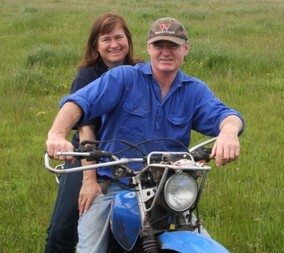 Gippsland Food Adventures was established by Paul and Jenny, who met while studying Agricultural Science at Melbourne University. After working throughout south eastern Australia they settled on the family farm in south Gippsland in 1991 to produce premium quality beef and lamb. We want to combine our passion for farming, food, wine and cooking to create innovative experiential adventures that showcase Gippsland’s fine produce and people. We love travelling (to food and wine destinations! ), and meeting the locals, to get a deeper sense of their culture, lifestyle and produce. We want to recreate this opportunity for visitors to Gippsland, as well as bringing new culinary experiences to Gippslanders. Our “Malabar Farm” is home base for many of the Adventures. It is 180km south east of Melbourne – a picturesque two hour drive from Melbourne, either along the coast or through rolling hills of dairy country. After completing tertiary qualifications in Agricultural Science and Agricultural Economics Paul worked as a farm management consultant and farm business analyst, before taking over the reins at Malabar Farm. He also oversees the management of two other beef properties in Gippsland, giving him control over nearly 2000 cattle and up to 7000 sheep. But he still finds time to follow his children’s sporting pursuits and experiment in the kitchen! Jenny completed a Diploma in Education after her Agricultural Science degree, and started her career working in adult education. For much of the last 17 years she has facilitated farmer, corporate and government groups in workshops and training programs and been heavily involved in leadership development and training, having recently completed a 3 year stint as facilitator for the Gippsland Community Leadership Program. She has a burning passion for promoting sustainable agriculture and the people who practice it.